What is the CeMAP Classroom Paper 2 & 3? This course is designed for people who have already passed CeMAP Paper 1. If you wish to study this now, we offer it in a 5 day classroom course. Is the CeMAP Classroom Paper 2 & 3 course right for me? 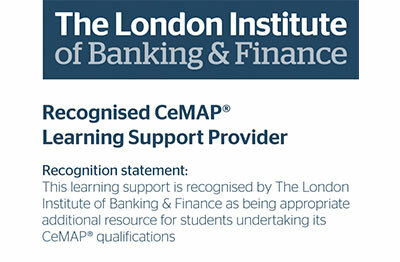 The CeMAP Classroom Paper 2 & 3 course is for you if you have already done CeMAP Paper 1, either online or in-class, and you wish to continue your studies towards the full CeMAP mortgage advice qualification. How will the CeMAP Classroom Paper 2 & 3 course advance my career? CeMAP is the benchmark qualification for Mortgage Advisors in the UK. Seen as the gold standard, it is held by over 80% of UK Mortgage Advisors and permits them with a “licence to practice” in a professional environment. The CeMAP exams are regulated by the FCA, these exams are required to gain a licence to practice mortgage advice. Why study the CeMAP Classroom Paper 2 & 3 course with e-Careers? What does the CeMAP Classroom Paper 2 & 3 course cover? Hello, I am interested in your "CeMAP Paper 2 & 3 - Classroom".